OMEGADYNE® offers K-Series Tee Rosettes for Axial strain transducer designs. 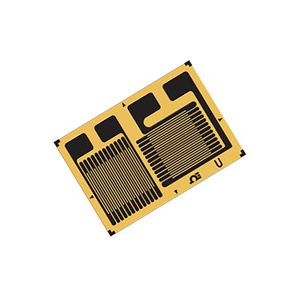 Precision Karma material offers excellent temperature and fatigue characterisitcs. K-Series gages have plated solder pads which make soldering quick and easy. No special solders or fluxes are required. SGK-B3A-K350U -***** has 2 separate strain gages with perpendicular grids on a single carrier. SGK-BH3A-K350U-***** is a half-bridge design, with 2 strain gages, perpendicular grids with a common lead/pad on a single carrier. SGK-B5A-K350W-***** is a half-bridge Tee Rosette design, often used for column load cell design where high accuracy is a requirement. The geometry for this strain gage is shown with the tabs along the top, and the center strain gage is vertical, and used for the principal stress direction in the column. The Perpendicular grid is split, half on each side. This may also be known as transverse grid. The transverse grid tends to correct for bending strain, or off-axis loading in the column.